The Library Legacy Circle of The Benjamin Ide Wheeler Society is a group of donors who have remembered the Library in their bequest plans. 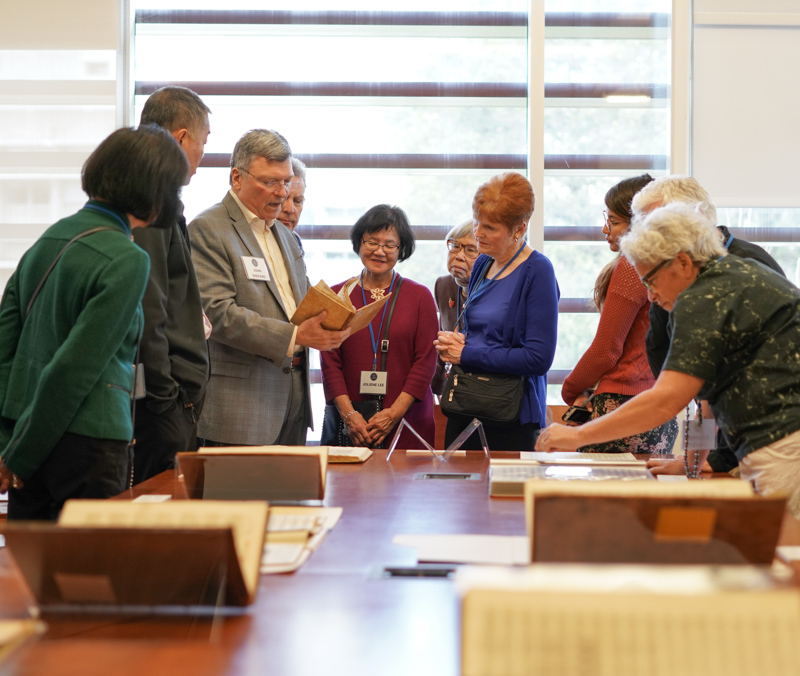 Library Legacy Circle honorees are alumni and friends who understand the Library’s vital role as a gateway to discovery and a cultural heritage institution for UC Berkeley. Invitations to special events, including our Luncheon in the Library, and exclusive insider opportunities. A subscription to Fiat Lux, the University Library’s newsmagazine. Honor roll recognition in our annual publication. Keepsake Library notecards that highlight our many diverse libraries. A Library privilege card (for California residents who choose to opt in). Undoubtedly the university’s most generous benefactor, Phoebe Apperson Hearst provided support for a competition to design an architectural plan for the campus between 1896 and 1897, including the construction of a new library building. Hearst frequently presented the Library with volumes from her personal collections, many of which today can be found in The Bancroft Library and in the Main (Gardner) Stacks, in Doe Library. Impressed with the impact that the Library of Alexandria in Egypt had on civilization at that time, Charles Franklin Doe pondered ways to support the founding of a major library in California. Upon his death in 1904, Doe left a quarter of his estate (nearly $600,000) to the Regents of the University of California for the construction “of a library building for its Academic Department.” Today, Doe Library remains a great testament to his generosity and vision. In 1873, Michael Reese, one of the earliest major contributors to the UC Berkeley Library, first supported collections in economics and politics. His bequest of $50,000 in 1879 established the Library’s first endowment, a fund to purchase books for the collections in perpetuity. The Reese Library Fund is still being used today as a major source of collections support. In 1879, Henry Douglas Bacon, a self-made man and prominent Oakland citizen, feeling that the library in South Hall was inadequate, gave $25,000 to the university for the construction of a separate building, subject to the state of California providing a similar amount. The Legislature eventually complied. Bacon also gave his book and art collection to be housed in the building. The Alexander F. Morrison Library was made possible by a significant gift from Morrison’s widow, philanthropist May Treat Morrison. Both were members of the Class of 1878. In contributing her husband’s book collection to the Library, May Morrison was acting on her belief that the books that had been the delight and enthusiasm of Alexander Morrison’s life could serve no finer purpose than to inspire a love of reading in the students of his university. A member of the Class of 1874, Joseph C. Rowell was appointed as the first full-time university librarian in 1875, serving in that role until 1919, when he resigned and became the first university archivist — a post he held for 19 years. Under Rowell’s care, collections grew from 13,000 volumes to more than 1 million volumes in 1935, establishing the Library as one of the foremost research libraries in the country. A graduate of the Class of 1886 and a UC Regent, James Kennedy Moffitt was a longtime and generous donor to the Library. He established an endowed fund for collections in 1897 that remains in use today, and, upon his death, bequeathed the Library his personal collection of books. A beloved UC professor of history, and a key influence in encouraging the Regents to acquire The Bancroft Library in 1905, Henry Morse Stephens loved the Library. When he passed away in 1919, he left the University his 12,000-volume library, a part of which forms the nucleus of Bancroft’s collections today. As president of the University of California, and UC Berkeley’s first chancellor, Clark Kerr was admired as an elegant thinker of great intellect. His clear, logical vision of both the promise and problems of modern higher education influenced generations of leaders. He initiated the creation of an undergraduate library on campus that came to pass with the opening of the Moffitt Library in 1970. The university was still in temporary quarters in Oakland when Daniel Coit Gilman arrived to assume the position as its second president in 1871. Just 14 months later, he could report not only the establishment of the university on its permanent campus in Berkeley, but also a number of important major gifts from individuals, including funds for the purchase of books for the Library.